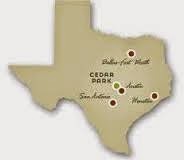 Cedar Park, Texas is part of the Greater Austin Community. It is is a small city-town, near Austin, Texas, the state capital, that was incorporated in 1973. Since 2005, the community’s population has grown by about 30%. In 2010 the population was a little under 50,000 and by 2015, it is projected that the population will have increased by another 30% to approximately 65,000. The boundary lines encompass two Texas counties, Travis and Williamson, and it is is the third largest city in the Austin Metro area. It is a lovely and thriving family oriented community with a rural feel to it; located just 20 minutes from downtown Austin, the state’s capital; making it close enough to provide easy access to all the facilities and services the big city has to offer. A current project, the Schlitterbahn Cedar Park; a water park resort, had a targeted opening date of May 2012; however, the incentive package expired. The City Council is still interested and they are optimistic about reaching their goal. Visit the city’s official website to view more projects. Home building efforts for this lovely city can be credited to a response by the city’s economic development representatives who invited IBM (over a decade ago) to relocate their business to Austin, Texas. IBM indicated that if they accepted the invitation they would need a place to relocate their employees along with their families. The real estate market consist mainly of single-family homes for sale, starting in the low-$100,000s and can go as up to $650,000 plus. It has all the appeal of small town charm with the conveniences of living in and living close to a metropolitan city. There are golf course properties, condominiums, townhouses; and land is also available for custom building. Investors (or home-buyers) can locate foreclosures, short sales, bank owned properties, and other investment real estate. Perfectly situated between metro Austin and the Texas Hill Country, it could easily be classed on any official listing of Best U.S. Cities to Live In. It’s a fine place to own your home, excellent for real estate investing, and a great place to retire.